Overall question: What should I know about 3D printing? * This lesson is designed to have students come up with their own driving question, which guides their research and presentation. Different groups will have different driving questions. Although not exhaustive, here is a list of questions students may ask and articles that attempt to answer them. Students will work in groups to answer questions and then share out their knowledge to the whole group. There are several ways to ensure all students are actively reading and digesting information in order to create a product to share with others. Letting students select which question they are most interested in investigating will improve engagement and focus. Accountability: The summative rubric includes a row for group work contributions, which is then linked to their overall grade for the project. Alternatively, or in addition, students could provide feedback on their group dynamics and assess their teammates. These literacy lessons are designed to provide the background knowledge necessary for students to successfully interact with 3D printing and scanning tools. Subsequent lessons will focus on the individualized technology available within the classroom and its curriculum connections. This presentation can be graded using The Buck Institute’s performance and collaboration rubrics. Consider using presentation rubric and adding a collaborative row like the rubric posted below. Download rubric for this lesson. Many students have heard of 3D printing, and they may have even seen it in action, but few students understand the vast possibilities 3D printing opens across industries. The following TED talks provide students with a brief introduction of 3D printing and its real-world implications. The examples provided in the videos of 3D printed applications will help students to generate questions about 3D printing, scanning, and digitization that they will then try to answer during class time. To start, engage students with the introductory video. When it is over, explain that 3D printing, scanning, and digitalization is an innovative and exciting part of the scientific community. In order to be able to successfully utilize the technology, we have to build our own background knowledge. Ask students to brain dump any questions that have about 3D printing, scanning, or software individually for 3-4 minutes. Within small groups, students will whip share one question from their list. As they listen to the questions others have, they can add to their own list or write a check mark indicating that others shared their questions. This will continue until all questions have been raised. Explain that 3D printing, scanning, and digitization has so many components and applications that it’s hard to understand it all at once. However, today’s goal is to decide on the most compelling questions we have about 3D printing and find the answers to those questions. Keep in mind that eventually, this class will use a 3D scanner to create our own digital files that we can then print on our 3D printer. We will focus on fossils because it connects to our Earth Science curriculum and because 3D printing is really useful to print copies of fossils that we don’t have access to. But for today, we want to create a foundational understanding of how it works and how it’s used. Students will then work in groups to narrow their list of questions down to the top 3-4. Ask students how a group goes from a big list to a smaller list. Listen for answers like, “We can look to see which questions overlapped” or “We can cross out the smaller, more detailed questions and instead keep the bigger ones.” These ideas will help groups narrow their questions to the best questions for this activity. Allow students 10-12 minutes to narrow their list. When everyone has their list of 3-4 questions, have groups share one question at a time and record questions for everyone to see. This list will also have to be narrowed to approximately 5-6 questions. Teachers can decide how many groups they would like in a given class and then make sure there are that many questions. Students will then select which driving question they would like to investigate. Consider using equity sticks to let students pick, while making sure that students are assigned to all driving questions. Once groups are formed, pass out the graphic organizer. All students will have to complete the graphic organizer, but they only need to create one final presentation to the group. Explain to students that they will now have 20-25 minutes to answer their question. They can use articles online, videos, websites, or other media that help to answer their question. The research graphic organizer requires them to locate two different pieces of information, helping to ensure that content is accurate and complete. As they read, listen, and watch, students should record the most important information that they want to share with others. As students complete this work in groups, the teacher should circulate and check for accuracy and understanding based on written answers on the research graphic organizer and quick conversations. If students are having trouble locating information, provide them with search terms that will generate specific and accurate information. For example, if they just search “3D printing” they will have to sort through lots of information, but a search of “software for 3D printing” is much more specific and will help them find articles more easily. Model this for students so they can hear how to organize their information. For example, if my question was, “How does 3D printing and scanning relate to paleontology?” I would first say that scanning and printing fossils allows students to observe physical models of really old fossils that are too valuable to use in a classroom. Then, I would provide examples of how I can scan, print, and use fossils. I would make sure to include pictures while explaining so the audience could see what I’m talking about. I might also show links that either clarify or enhance my explanation. Finally, I would reinforce my main point that 3D printing and scanning are really important in paleontology because kids can touch fossils that they otherwise wouldn’t have access to. After students have created their talking points, they will want to create a visual aid that enhances their key points. Students can decide which type of platform best meets their needs, but it could be as easy as a Google Doc or Slides. Students can include links to videos, images, or diagrams that support their information. Remind students that successful presentations link words and images, but that a presenter should not read slides verbatim during a presentation. Before ending class today, complete the exit ticket to make sure groups are on track with their research and most important points. To start class, remind students their goal for the day: to create a visual aid that enhances the they points of their research. Remind students that successful presentations link words and images, but that a presenter should not read slides verbatim during a presentation. Students will then work on their visual presentations for 20-30 minutes, depending on their progress and time. As students wrap up their visual presentations, encourage groups to complete 1-2 practice runs of their presentation to make sure the information is clear, organized, and accurate. Presentations tend to flow better if they are practiced, and presenters feel more confident as well. When all groups are ready to present, decide on an order that makes sense. This is where the teacher can thoughtfully build background knowledge of the group, starting with presentations that answer more basic questions and gradually becoming more specific. Be sure to go over audience expectations while groups present and require audience members to take notes on each presentation. This will help create a place where they house their knowledge of 3D printing, and it also helps them to ask thoughtful questions at the end of each presentation. As each group presents, consider asking for completed graphic organizers so you can reference them as groups share information. 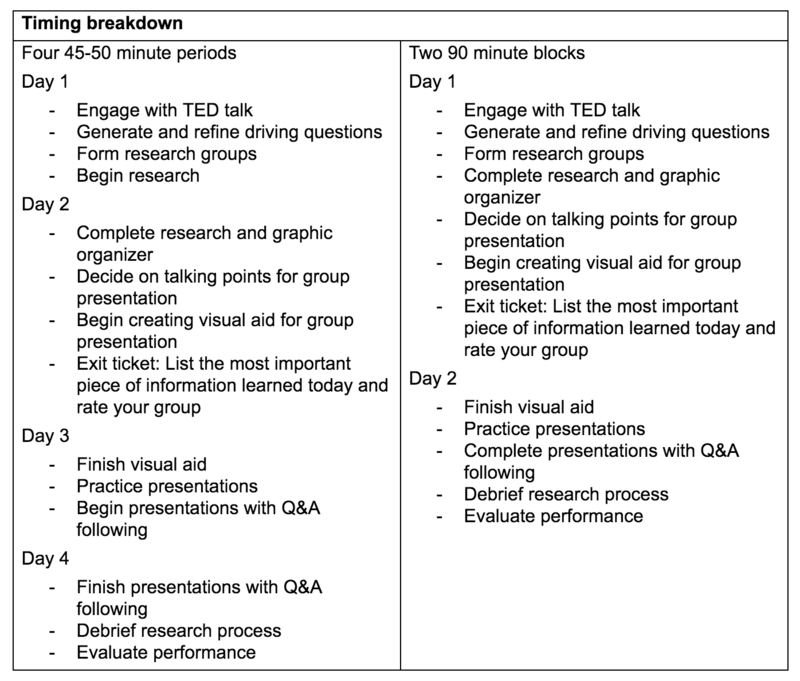 You can also have the rubrics in front of you and grade as groups present, saving time later. After each group presents for 3-4 minutes, the audience should ask a few questions about the content, either asking for clarification or additional information. Not all groups will be able to present in a 45-50 minute class. Plan on finishing presentations the following day. Finish all remaining group presentations. As each group presents, consider asking for completed graphic organizers so you can reference them as groups share information. You can also have the rubrics in front of you and grade as groups present, saving time later. After each group presents for 3-4 minutes, the audience should ask a few questions about the content, either asking for clarification or additional information. When all groups have presented, it is important for students to reflect on their own learning and rate themselves. You could have students rate themselves on the BIE rubrics or answer any of the following reflection questions. You could also discuss these questions aloud as a group. What information helped you to understand the function and use of 3D printing the most? What did you find most interesting about the information you learned today? What did you enjoy most about this learning experience? What would you change about this learning experience? 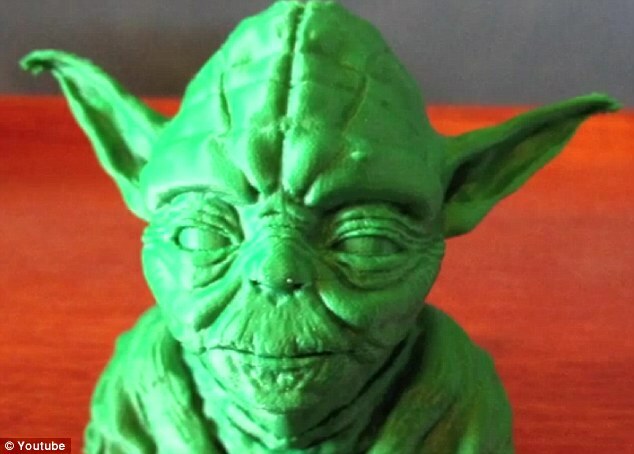 What questions do you still have about 3D printing? Overall, how well did your group work together? Acrylonitrile butadiene styrene (ABS): Acrylonitrile butadiene styrene, otherwise known as ABS, is a thermoplastic commonly used as the build material or ‘filament’ in fused deposition modeling 3D printers. It’s fairly strong, but it’s also a bit tricky to work with (and gives off odors when melted). Additive Manufacturing: Additive manufacturing is the process of building up a three-dimensional object, one thin layer at a time. 3D printing is only one category of additive manufacturing, though the two terms are frequently considered to mean the same thing. Computer Aided Design (CAD): Computer aided design, or CAD, is software that enables users to create models in either two or three dimensional formats. While CAD was initially developed for use in the architecture and manufacturing industries, consumer friendly applications are now readily available for little or no cost. Filament: Filament is the base material that’s used to 3D print objects via fused deposition modeling. Filament is usually a thermoplastic — such as ABS or PLA — that’s fed to a print head as a solid, then heated to melting point for extrusion through a small nozzle. Filament is commonly available in spools of either 1.75mm and 3mm diameter widths. Functional Prototype: A functional prototype is a near-final model or representation of a product, created during the design process to evaluate the form, fit and function of an object and its constituent parts. Functional prototypes don’t necessarily have to be built from the same material as the final model (though it might help). For example, a platform jack may be 3D printed in plastic to test for fit and movement, before final production in metal. Fused Deposition Modeling (FDM): Fused deposition modeling, otherwise known as FDM, is a 3D printing process that extrudes heated thermoplastic material through a computer-controlled print-head nozzle to build parts up layers. FDM is actually a term that’s been trademarked by Stratasys. This led to the RepRap open-source community to coin the term “fused filament fabrication” (FFF) for a more generalized and legal way to describe the process. G-code: G-code is the language used to instruct your 3D printer to perform operations. In common usage this is almost exclusively generated by software, and is not written by hand. G-codes control specific actions like motion, speed, rotation, depth, and other related switches and sensors used in the operation of a machine. Polylactic Acid (PLA): Polylactic Acid, otherwise known as PLA, is a biodegradeable plastic that’s used as the build material or ‘filament’ in fused deposition modeling 3D printers. This material is easier to work with than ABS, and the smell is not so unpleasant, but the trade-off is that PLA is structurally more brittle. Rapid Prototyping:Rapid prototyping is a group of technologies used to quickly fabricate a scale model of a physical part or component using three-dimensional computer aided design (CAD) data. Construction of the part or component is usually done via 3D printing or additive manufacturing technology. More recently, the term ‘real-time prototyping’ has become popular, but essentially it means the same thing. RepRap: RepRap is shorthand for “replicating rapid prototypers”, machines which are open-source 3D printers utilizing the fused filament fabrication process. One of the defining characteristics of a RepRap machine is that it should be capable of printing out its own parts (but not necessarily all of them). Various RepRap designs and build instructions are freely downloadable from reprap.org, where they proudly describe their printers as “humanity’s first general-purpose self-replicating manufacturing machines”. Selective Laser Sintering (SLS): Selective Laser Sintering, or SLS for short, is a technology commonly employed by 3D printing services for metallic objects. SLS is a powder bed fusion 3D printing technique that uses a laser to selectively fuse — or sinter — together the granules of successive layers of powder. Slicer: A slicer is the software package used to divide a 3D model into flat layers, which are then printed one at a time. The output of a slicer is G-code that controls the path, speed, and temperature of the printer. Slicer software packages are available in both open-source and proprietary programs, and they’re an essential tool for successful 3D printing. Stereolithographic Apparatus (SLA): Stereolithography is a 3D printing technology that works via a process called vat photopolymerization. Objects are built in layers using a Stereolithographic Apparatus, or SLA for short. This works using a laser beam to trace out and solidify each successive layer of an object on the surface (or base) of a vat of liquid photopolymer. Students can have little to no background knowledge on 3D printing, scanning, and digitization, as this is the foundational lesson which subsequent lessons will be built upon.